Did you know that sugar plums are not actual plums with sugar but hardened sugar shaped and colored after real plums?! When I was creating the recipes for this year’s Thanksgiving menu, I decided with joyful conviction that I wanted something that involved sugared plums, or plums covered in caramelized sugar. They have my favorite color of the fall season after all, which will always be burgundy. It evokes in me a romantic feel of the mood around it; quiet, shadowy and ethereally beautiful. A mood my mind always loves to have. I decided that Sugared Plums would have to be part of the tittle. The dessert was developed around the tittle. It was that important. I’m almost certain I gained a couple of pounds while thinking about all the possibilities. Gallettes are more of a snack for me, pies could sometimes be too sweet and a cake is kind of a heavy dessert after a meal of that proportions. That’s why I though of a cheesecake. Traditional and simple, it is the perfect ending for a fulfilling meal. 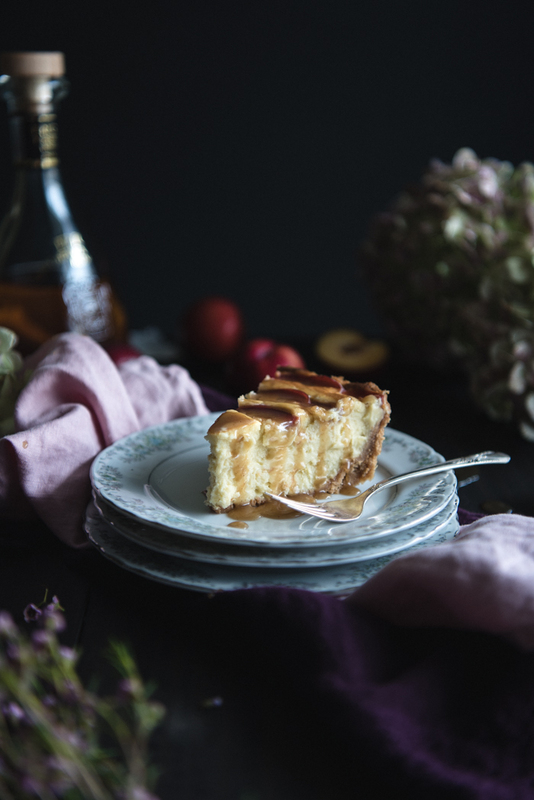 This cheesecake is luscious, soft and creamy. I didn’t get any cracks because I pace myself through the cooking and cooling process. As with the turkey, I used high heat to make the ingredients react fast and water in the oven to keep the cake moist. After baking, I leave it in the turned off oven with the door half way open for a couple of minutes, then let it cool down completely in the counter before chilling, so the cake never suffered from drastic changes in temperature. I didn’t add any sugar to the crust as other recipes call. It would probably end up too sweet for my taste. Instead it has a nice, warm and well balanced flavor profile; some sweet and saltiness form the crackers, a tangy taste from the cake, sweet and sour notes from the plums and a warm end note with the brown sugar, cinnamon and dark rum from the caramel sauce. This rum is completely optional of course, if you happen to have around some go ahead and use it. I’m including a link to this guide on how to make the perfect cheesecake from The Kitch. I didn’t use sour cream or yogurt in my recipe, but the definitely took a note on the other tips mentioned. 1. This is a make ahead dessert. Ideally you want to serve it one day after making it, because the flavor and texture really benefit from chilling at least 8 hours. 2. You could make ahead the caramel sauce too. Just warm it up a bit in a small saucepan or even in the microwave until it becomes pourable again to serve. 3. 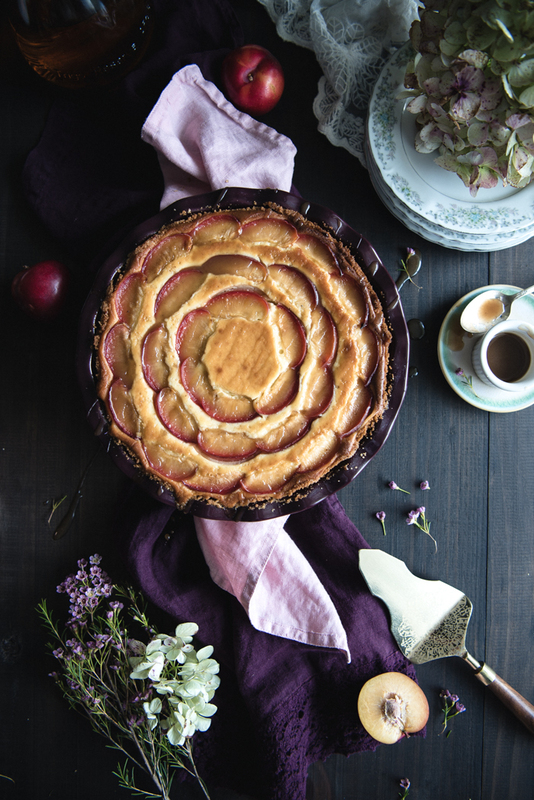 I used this deep violet pie dish you see in the pictures because I couldn’t resist that color in contrast with the plums, but you may us the traditional springform pan. 4. You may find arrowroot in specialty or natural markets. If you don’t have some, you may use cornstarch. Place the cookie pieces with the salt in the bowl of a food processor already attached to the base. Pulse 2 times to integrate everything and make the crumbs smaller. Start running the food processor again and pour in the melted butter, just until the crumbs are very fine and compact, about 15 to 20 seconds. If there are still big crumbs of crackers, integrate the crumbs stuck to the wall of the bowl and pulse a couple of seconds more. Transfer the content to the pie dish or the baking pan you will be using. Press onto the bottom and up to the sides, until the crumbs are evenly distributed and you have reached the edges of the pan. You may use a bottom flat bowl or utensil to help yourself press down and distribute the crumbs (as you see in the picture I used a measuring cup). Bake for 5 minutes, then place it in the fridge to cool down. Increase oven temperature to 500° and preheat. Either in the bowl of a stand up mixer or in a medium bowl using an electric hand mixer, beat together in low speed the cream cheese, sugar, flour and lemon zest. Mix in the vanilla. Start adding the eggs and egg yolks, one at a time. Scrap the wall of the bowl between additions, if needed. Stop beating as soon as the last yolk is incorporated. Place baking pan in a baking sheet. Pour filling into it and top it with the sugared plums (recipe follows) Place the baking sheet with the pan on the middle rack of the oven. Fill the baking sheet with water until half. Close oven door and bake for 10 to 12 minutes, until puffed. (Check it out around the first 10 minutes, if it seems burned or you see any crack, turn down the oven temperature at that moment.) After that, turn down the oven to 200° and bake for 1 hour more, until the cheesecake is firm but the center is slightly wobbly if pan is shaken a bit. Turn oven off and let the cheesecake there with the door halfway open for a couple of minutes, then take it out and let it cool down completely. Loosely cover the cheesecake with plastic paper and place it in the fridge. Chill for at least 6 hours or overnight. *Cut the plums transversally in halves. Cut one half through the center. Cut that piece in half and then slice them in half. In a bowl mix the brown sugar with the arrowroot, using a fork to break any lumps. As if you are breading a piece of food, throw a slice of plum over the sugar mixture, then turn it a couple of times until the piece of fruit is well covered with the sugar. Put it over the cheesecake. Repeat with the rest of the slices, placing them slightly overlapping in the corners in a circular direction if you want to create the scalloped effect. In a small saucepan combine the sugars with the water. Bring to a boil over medium high heat. Cook without stirring for 10 minutes, until the sugar has dissolved completely and turned into a deep brown hue. In the meantime warm the cream in the microwave, in 10 or 15 seconds intervals (two times worked perfect for me). When the caramel is ready slowly pour in the cream while whisking the caramel. Be careful since the sugar will burst at the fisrt pouring of cream. Bring down the heat and simmer for 3 minutes more. Remove from heat and whisk in the butter, cinnamon, salt and rum (if using). Serve warm. If making ahead just reheat it a little so it becomes warm and pourable.